Living in Venezuela? 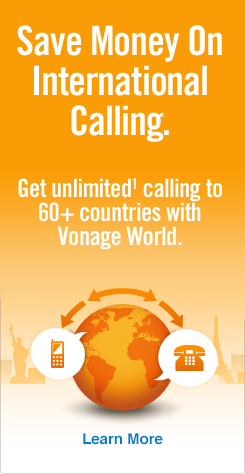 With Vonage, calling the U.S. from Venezuela has never been easier! Relocating to another country can bring added stress, so keeping in contact with those you care for is essential — and Vonage is making it simple to learn how to call the U.S. from Venezuela. We’re using UPS to ship Vonage Boxes™ (VoIP Phone Adapters) to Venezuela. The Vonage Box sets up easily, is portable and gives you incredible call quality nearly anywhere in the world. What’s my plan of choice to call the U.S. from Venezuela? Unlimited¹ calls from Venezuela to the USA on landlines or mobile handsets. Strong call quality to keep you connected. Domestic calling — Vonage Boxes shipped from the U.S. to Venezuela have U.S. numbers, which means U.S. numbers calling those Vonage Boxes are domestic calls. They’re U.S. numbers calling U.S. numbers. Never worry about hidden fees or surprise charges. Connect more while paying less. Making calls back to the U.S. has never been easier. The Vonage World plan shows you how easy it is to call the USA from Venezuela, without paying an arm or leg, or a shady foreign phone service. So don’t hesitate, check out Vonage World today! ¹Unlimited calling and other services for all residential plans are based on normal residential, personal, non-commercial use. A combination of factors is used to determine abnormal use, including but not limited to: the number of unique numbers called, calls forwarded, minutes used and other factors. Subject to our†Reasonable Use Policy†and†Terms of Service.